I figured it was a good time for something very simple. If you are like me, you are planning, shopping, arranging and preparing for Thanksgiving and don’t need another complicated dish to make (or even think about) this week. Truth be told, I am only responsible for one side dish and two desserts – totally manageable and enjoyable. I’ve made both desserts many times before: blueberry pie and pumpkin pie – so there will be no recipe surprises to contend with. I rather like both recipes, so if there is time to photograph them, I will post one or both after Thanksgiving. Now, back to the recipe at hand. I was introduced to a very simple, yet clever, little egg dish at a brunch that I have adopted as my own. I’ve only shared the recipe once, and my confidante is a convert as well. It’s called “eggs shaken” – loosely named after the person who concocted it, nothing to do with being shaken, which it’s not. The surprise ingredient, wheat germ, adds textures and a subtly nutty / wheat-y flavor. Try fitting it in between turkey and leftovers; it cooks in a few minutes and cures all holiday food transgressions (well, not really, but wouldn't that be nice?). Heat a pat of butter and a few drops of Tabasco sauce (if you like a little heat) in a small skillet over medium heat. Making this dish in individually sized portions is best (I use a small (~6 inch) cast iron skillet). 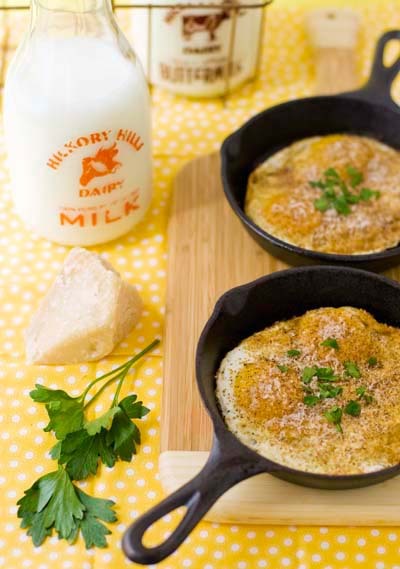 Break two eggs into a small bowl and gently pour the eggs into the skillet so as not to break them, and to start the eggs cooking at the same time. 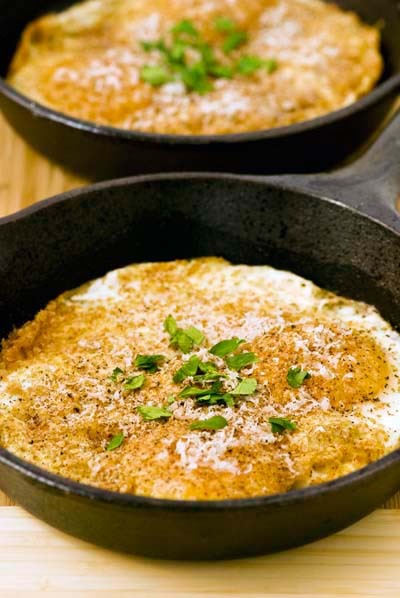 Once eggs have begun to set, sprinkle with 1-2 tablespoons wheat germ, and then sprinkle with freshly grated parmesan cheese. Generously dust with coarsely-ground pepper. Salt to taste. Just before eggs are cooked to your liking, turn heat to high for a few seconds so that the eggs sizzle when served (a little drama). Serve in the skillet (on a trivet or tea towel so you don’t burn your table)! Let me know how it goes. In addition to being a great cook you are also a superb food stylist/photographer. This recipe sounds delicious. By the way, what side dish are you making for Thanksgiving? I absolutely love this dish. Since it can be fried up in a small pan and is best made in individual portions, it's perfect for me, I'm the only real breakfast fan in my family (lonely me). I never really add cheese, it's the wheat germ that makes the recipe, in my opinion. My three year old even eats this! GREAT photo. I dig the presentation. Excellent way to dress up a simple dish. Do you have to factor into the cooking time the heat that persists in the cast iron skillet once off the stove? This looks fantastic - I can't wait to try it! Eggs have a special place in my heart - love everything with them. And after I read "parmesan" I knew it would become a favorite recipe. ...Didn't mention that on Flickr. Thanks Larry! I'm making a potato and red onion dish that bakes in muffin tins - excited to try it! Thanks Al and Ms. Evinrude. Amy: Yes, you do need to figure that the eggs will keep cooking as long as the pan is hot but you don't need to wait too long before eating them. Thanks Martha, let me know. Thanks for visiting Patricia, Graeme and Annemarie! This looks amazing -- I love the photo! It looks great. i assume it can be made from egg whites and oil instead of butter for us chlosterol and weight watchers, may be with a little dried tomato and yellow pepper for taste and color. It seems that you got off easy for Thanksgiving given the success and popularity of the blogsite. I love the photo with the polka dotted tablecloth. Gorgeous photos and a brave and talented cook!